“Build from the back” is a popular adage in soccer. Find a back line that can both defend and control the ball, and goals will follow on the other end. 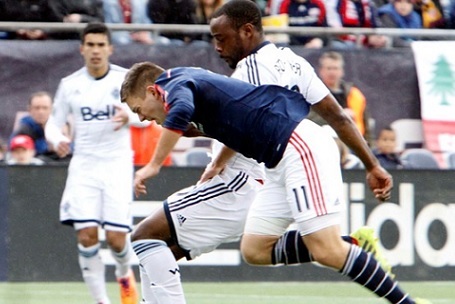 New England’s defense finally played to its potential against Vancouver on Saturday. But the offense is still hibernating from this dreary Massachusetts winter. The Rev have yet to score in three games this season, a troubling sign for a team looking to make another playoff run. Just one team has ever gone 270 minutes without scoring to open the season a year after making the postseason (last year’s Chicago Fire squad who, for what it’s worth, also lost 4-0, 1-0 and drew nil-nil over its first three). On the one hand, the Revolution could easily have scored a few goals by now. The Whitecaps goalkeeper reacted brilliantly to tip Andy Doorman’s header over the bar in the fifth minute on Saturday. Diego Fagundez was played through by Teal Bunbury against the Philadelphia Union and probably should have scored. A.J. Soares found the woodwork with a header during the blowout at Houston. With a fortuitous bounce or two and slightly more clinical finishing, the Revs could be sitting here with a handful of goals and three or four points. On the other hand, the forwards haven’t played anywhere near their potential. Bunbury hasn’t been the No. 9 that many thought he’d be, which may or not be fair considering who he’s essentially come in to replace. Fagundez has not been as involved as he should be, and his finishing has lacked conviction. Kelyn Rowe and Lee Nguyen have frequently had to operate on their own. None of the three players who’ve have earned starts on the right wing have shown any desire to claim it as their own. In fairness, the front line has not received the service that it needs to thrive. The midfield has struggled to hold up the ball at times, and possesion has been hard to come by. The defense has had three different lineups in three games, and never looked like putting it all together until the Vancouver game. It is easy to see three goose-eggs and blame Bunbury, Fagundez, et al., but that would be obscuring a larger problem. The entire team has not played well. The goals will come eventually—as Brian O’Connell pointed out in his recap of the game, even a putrid 2010 D.C. United team found the net 21 times. If the Revs offense begins to click, this team absolutely has the quality to make another trip to the playoffs. If all the Revs can muster is a few more set piece opportunities and some lucky bounces, it could very well be a long summer.